To ensure your email marketing campaigns are as successful as they possibly can be over the next few years you will need to make sure that you are optimising your emails for mobile. Recent research from Kelkoo suggests that the UK is set to spend £4.5 billion on mobile devices in 2012, making us the biggest mobile shoppers in Europe! Many retailers, such as Aldo, are creating websites designed specifically for the mobile shopper. A couple of months ago I received the email below, it rendered quickly and easily on my smartphone and with a strong subject line I was keen to open it. Once opened information was kept to a minimum, the text explained, in bullets, why this service would benefit me and then the two clear CTAs; ‘Shop now using your mobile device’ or ‘View full site’ in case I was viewing the email on desktop. 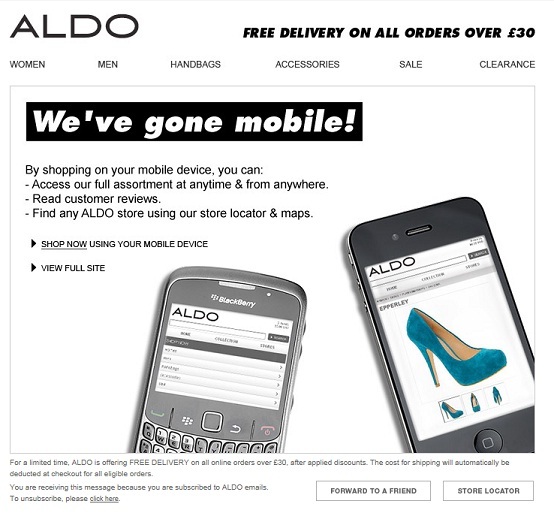 Although not all marketers have the budget to create a site optimised specifically for mobile there are some simple tips you can follow to ensure your emails are optimised for mobile, just like the Aldo example above. Keep subject lines short, snappy and to the point. Why not make the pre-header text a continuation of the subject line or a mini message in itself? Consider moving the unsubscribe and click to viewer in browser links elsewhere as less space means you need to get to the point of the email quicker in order to keep the recipient’s attention. Slim down the width of your emails – 550-600 pixels to account for desktop users as well. CTAs are really important in emails so give them more impact on a mobile screen by presenting them in bold text in white space, you can also use bullet points and double spacing to make them stand out even more. Bear in mind that recipients are likely to be scrolling using their fingers, don’t give them too much to do or the chances are they won’t do what you want them to do (click through to your website, sign up for your newsletter etc). Last year, almost half (46%) of mobile users in the UK owned a smart phone which led to shoppers spending a total of £3bn on mobile devices (£192 each on average), representing 8% of total online spend. So, make sure you’re not missing out on the m-commerce revolution and optimise your email marketing for smart phones. To find more detailed info on email marketing mobile optimisation you can check out our guide.